All the new apartments in Salt Lake City have a lot to do with good employment numbers, population growth and low interest rates. City planners are also pushing for more housing along public transit lines. “A lot of what you see is affordable or has an affordable component to it,” says Claudia O’Grady. She’s with Utah Housing Corporation, which finances new projects that use low-income housing tax credits. “But the fact is that this is still a good market for market-rate housing developers and they’re taking advantage of that,” she says. Claudia O'Grady says the market is good for market-rate housing developments but rent is outpacing incomes. O’Grady recently caught a glimpse of what some new units are going for downtown when a developer approached her to see if he could help with the affordable housing crunch. Market-rate projects are outpacing affordable ones by a good stretch. But O’Grady says UHC has many affordable projects in the pipeline. A new development downtown has about 300 units with one-bedroom apartments for qualifying renters that go for about $850 a month. Another new project just west of the state capital has 79 income-restricted units. And the new Granary Place Apartments in the Central 9th neighborhood has 134 units for residents who make up to about $34,000 a year. Salt Lake City officials are working to create 1,000 affordable units. But studies show the city needs far more. O’Grady says making rent is no longer just a problem for the city’s poorest residents. O’Grady says market-rate developers are actually clamoring to help with the problem. But money to subsidize those projects is limited. 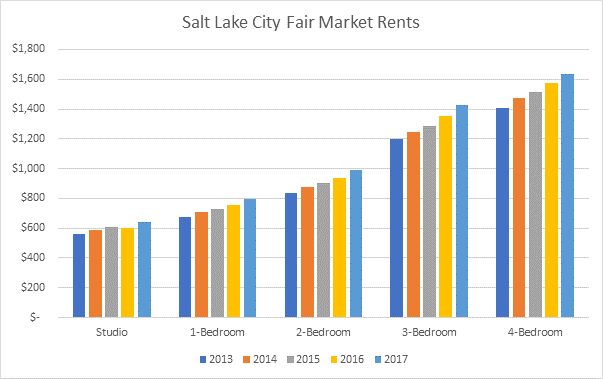 The fair market rent on a one-bedroom unit went from $839 to $990 — An increase of 18 percent. For that same period, Utah’s household median income went from $61,587 to $65,977 — an increase of about 7 percent. Crossroads Urban Center is calling for the creation of more shelter and housing options for homeless families in Salt Lake County. They’re releasing a Wednesday that shows the county’s existing services for homeless families are struggling to keep up with demand. Utah lawmakers say affordable housing will be a top priority in this year’s legislative session, which begins later this month. They say it goes hand-in-hand with ongoing efforts to combat homelessness.